The title is obvious but so hard to do. Why is that and how can understanding the science help you change personally and to support change in others? We find it so hard to change because our brain responds well to patterns and actively looks for them. Patterns are short cuts that reduce uncertainty and save energy. Routines or regular activities are run by the basal ganglia, which is an energy-efficient part of the brain – that’s why you don’t have to work out how to open a door every time you come to one. Many parts of our jobs are similarly a habit and done in a brain efficient way. Doing something different – breaking one of these patterns – sends an ‘error’ message to the amygdala, the emotional centre of our brain – and it’s the amygdala that creates a fight-or-flight-or-freeze response. Our prefrontal cortex can override this more primitive emotional response, which is why we don’t always run away whenever someone suggests we do something differently. But this override process can take up a lot of energy and doesn’t work will when we are stressed, very busy or tired. When we ask someone to work in a different way we know it creates a sense of pain in the brain which is experienced as a threat. In organisations there are five things that get in the way of change and five things that you can do to make it easier. 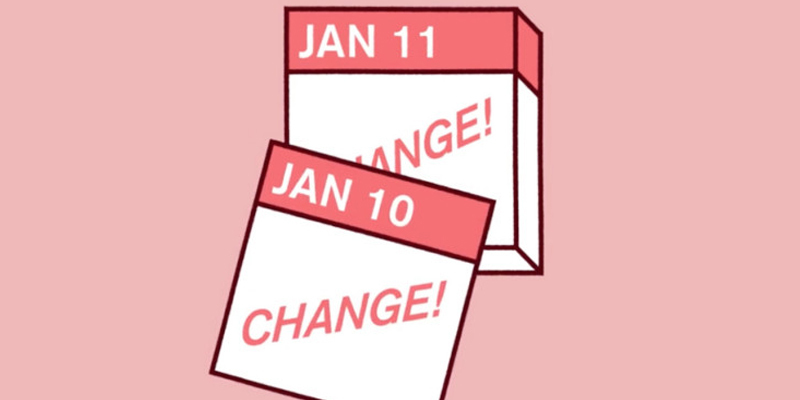 Because something like 70% of what we do is a habit, its automatic, to change people have to either create new habits or change an old one. Traditional change management doesn’t take into account this understanding of the brain’s functioning. Bonuses, incentives or coercion don’t overcome this biological reaction, and nor will simply selling the change programme more persuasively. Appealing to people’s intellect won’t help them circumvent their habits. When we ask someone to work in a different way we know it creates a sense of pain in the brain which is experienced as a threat. We want to avoid things and situations that our brains interpret as threatening. That’s why it’s so tempting to avoid thinking about a colleague’s disturbing behaviour or why it’s so easy to put off doing that tax return (even though you know that leaving it to the last minute is only going to make it worse). On the other hand, our reward or ‘approach’ sense is stimulated when we find ourselves looking forward to a meeting with a team we like, when we’re eagerly anticipating dinner with an old friend or simply keen to get on with a project we want to get our teeth into. These reactions happen at an unconscious level so we seldom put a label on why we act the way we do – but they still drive our behaviour. To stimulate more of the reward response involve people in both what needs to happen and how and why the change is happening. We know that having a clear vision of how things will be once the change is completed helps people to stay on track and adopt new behaviour. If people have a clear sense of purpose, a plan which they have created and goals and measures of success change is much easier. The CORE model is a quick and easy way to help understand and manage potential responses in yourself and in other people when influencing people or creating change. The CORE model is a quick and easy way to help understand and manage potential responses in yourself and in other people when influencing people or creating change. It’s based on research that has identified that people experience threat or reward in four key social situations (such as are found in day-to-day office life). 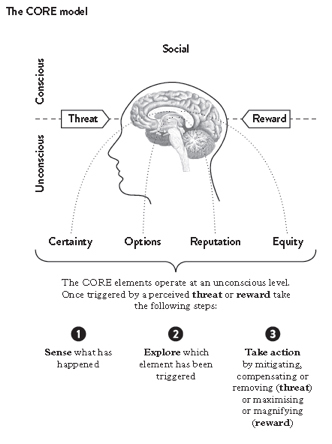 Understanding when a threat response might be triggered and how it could be avoided or minimised, and when a sense of reward can be created in each of these areas is essential for achieving change. Certainty: our confidence that we know what the future holds. Options: the extent to which we feel we have choices. Reputation: our relative importance to others (our social ranking). These four elements can activate either the reward or threat circuits in our brains. For example, a perceived threat to our sense of equity activates similar brain networks that a physical threat would. Similarly, a perceived increase to our reputation or social standing gives us the same buzz as a monetary reward might. The reaction happens automatically and instantaneously, before we’ve even had a chance to consider it rationally. You’ll find that threats are flagged up more often than rewards as we apply the CORE model. This is because our brains evolved to prioritise responding to threats because they’re critical to our survival. In a work environment, that means we need to offer many more or greater rewards than you might expect in order provoke a feel-good response to a new initiative. It also means that just one threat can negate the benefits of a number of reward offerings. Creating a sense of reward makes people feel good. They are more likely to collaborate and people who are in a good mood are more open to new ideas and change, they actually have a wider breath of perception and make more connections, are more creative and better able to come up with new ideas and to solve problems. Dweck’s studies show that people with a growth mind-set work harder, learn from experience and are willing to take more risks to achieve results. People with this mind-set believe you either have it or you don’t, and there are a range of behaviours which reflect this world view. The first rule of a fixed mind-set is look clever – at all times and at all costs. And if you’re not going to look clever, don’t do it. Dweck found that people with this belief system exhibit less persistence and less ability to learn from experience than those with a growth mind-set. Their mental framework provides no mechanisms for dealing with setbacks and this can mean they’re reluctant to take on tricky assignments or to work in new ways. In other words people with a fixed mind-set find change very hard. Dweck’s latest thinking describes organisations with this mind-set about their people and talent processes as having ‘cultures of genius.’ They revere, hire, promote and reward people who are great at what they do, right now. We frequently see these traits in senior leaders who introduce to a new company the same strategy that worked for them in their last company – irrespective of changes to the market, corporate climate or the differences between the two organisations themselves. In fact, it’s not unusual for recruitment briefs to request precisely this. For these people, it’s not about intelligence and talent, and even if they have these traits in abundance, they see them as simply a launch pad rather than the end point. They believe that mistakes are part of learning, that change is an opportunity to take a challenge and learn more. Dweck’s studies show that people with a growth mind-set work harder, learn from experience and are willing to take more risks to achieve results. Having a growth mind-set makes change more palatable, and mitigates some of the threat response. Organisations with this culture find changer easier. Taking breaks and reflecting all help people to handle change better. Do you find yourself creative, focused and speeding ahead in the morning but sluggish, prone to mistakes and flitting from one thing to the next later in the day? If so, it could be that your brain has run out of working energy. The conscious, thinking, analytical part of your brain is the prefrontal cortex (PFC). It’s immediately behind your forehead. We consistently over-estimate the capacity of this part of the brain to concentrate for an extended amount of time. The PFC processes something like 2,000 pieces of information each second, but while its performance is almost incredible, its endurance is actually quite limited. These facts about the brain’s capacity and our lack of understanding of them lead us to work in ways that are not conductive to maximising our brain’s potential. We have habits that fry our brain rather than use it in a way that’s brain-savvy. Taking breaks and reflecting all help people to handle change better both from the point of view of coming up with solutions and from the perspective of being able to manage their own reactions more positively. Different people work in different ways, of course, but most work norms value attention, concentration and focus. People who take a break, sit back and think or reflect are typically seen as lazy. Companies like Google that provide facilities for this type of activity are seen by established companies as quirky, and the general feeling is that they’ll ‘grow out of it’. But if we think about mental energy or the rate at which it is used, we might find that these companies are adopting a much more brain-savvy approach and along with it are better able to be flexible both individually and collectively. One feature of change is a need to redirect the energy of the organisation. Many leaders turn to negative energy generation. One feature of change is a need to redirect the energy of the organisation. Many leaders turn to negative energy generation. Indeed, management theory often encourages this with the emphasis on creating a ‘burning platform’ to motivate people to change. Negative emotions like anger, fear, hate and shame, effectively shock people into action by activating their survival instincts. Part 2 of this article looks at how the brain creates new work habits.